According to friends my pink lips are a "trademark". For years now I'm rarely seen without a punchy color lipstick and that color is usually pink. It's also become a popular color in my closet. Wearing pink makes me feel happy and girlie. 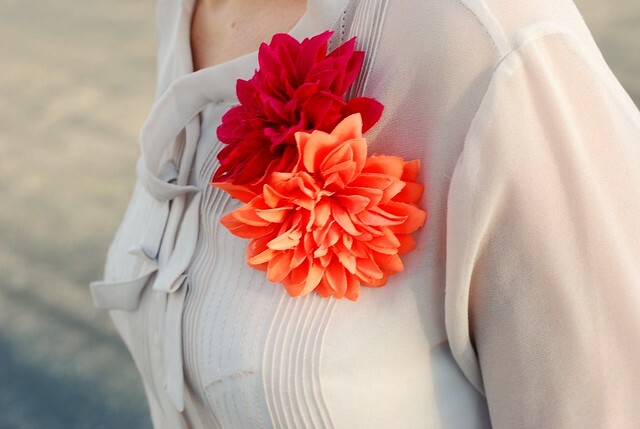 To give my outfit feminine flair I often add flowers. I've always been a flower girl (seen here, here and here) but after seeing Blair wearing two I had to try it. I also love my pink Coach sequin wristlet that was a gift from Eliot. She knows exactly what a glitter girl needs! If you love pink too check out this video. I love your punchy lipcolor and that skirt is such a great shade! Love the lipstick and the skirt. The added colors are adorable and definitely give the outfit a fun punch. Pink is really your color! It suits you perfectly! love these pops of pink... perfection. Is that skirt really from H&M?? Unbelieveable! love your pink inspired outfit! i just did an outfit post with pink assemble too! i love how we both are inspired by the same color, but come up with totally different styles. isn't fashion great?! we need a close up on the 'glitter girl' flats, those rock! love this whole get-up, esp the double flower pins! This is perfect. Your mix of colors is spot on, punchy is really the best word to describe it. I'm seriously loving hot pink and bright orange together for spring, it just makes me so happy! Loving the pops of color! Such a cute pink outfit! 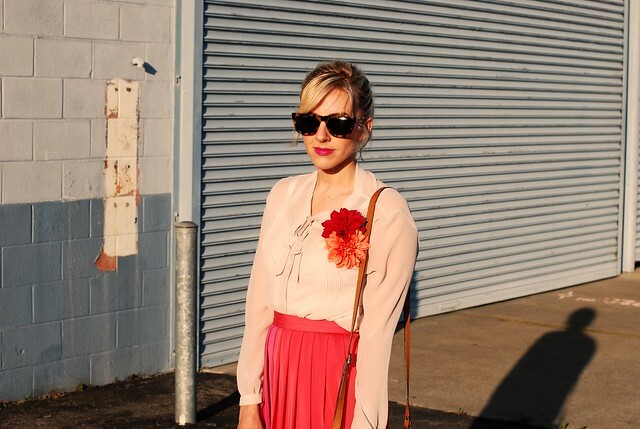 The flower pins make a great pair with the pleated H&M skirt. And I love your signature pink lip color on you! That pink skirt is gorgeous! And I love the flowers doubled up, they just add that extra punch! You look darling! This outfit makes me happy, I love pink too. That skirt is so cute! Jealous of your spring weather! You've definitely encapsulated the season to perfection. That skirt is fantastic!! I love the two tone it's such a sweet surprise! pink is so great on you! i love those pink flowers! that pink skirt is SO cute and spring ready! i have been looking for a pleated one just like that! That skirt is two fabulous for words. Love the orange and pink together. OMG. Great look. The skirt is fantastic. Love it! Loving that skirt, I tried it on, but it didn't fit me properly. You are rocking it perfectly!! So sweet, as always. I love the skirt. Is it 2 different shades? You look lovely! I adore the pink skirt and the sequin wrislet! I have the same top in black (thrifted) and I love it with that pleated skirt! Lovely outfit. The various shades of pink look so wonderful!! You look soooooo lovely in pink! Love that skirt! I am SO into hot pink right now and have been looking for the perfect skirt to add to my wardrobe, I am heading to H&M soon to try this one on! Thanks so much for sharing! Love pink, and love flowers!! so feminine. :) have a good day!! LOVE this whole look! That pink skirt is the best color! You could have way worst trademarks than a gorgeous pink lip. Especially when it's so gorgeous on you. You are so fabulous! Your posts keep getting better and better. I love how simple everything is yet so interesting. That skirt is pure perfection!! AND, I love the flowers. XO! Love the flower pins and the glitter purse! I'm not great at accessorizing, but those flowers look like such an effortless and pretty pop of colour that I might just have to go out and get some for myself. adore all the girly pinks on you--combined they are so fun/cheerful/pretty and fresh! You look great and happy! Pris --you know me so well!! oh, i love this! this skirt is lovely. I'm not much of a pink girl myself but you look so cute. that is an amazing spring combination! very inspired! Very Emmerson Made! Love it! I love the bright colors! Very pretty! Love the pink post! Looks happy and carefree. The color of your skirt is amazing! I really love pleats right now too. You are looking toned, tanned, and fabulous! Pink IS such a great color on you! Love it! You look beautiful and I love the color block skirt! So cute! Love the way you mixed the delicate pleats on the blouse with the larger pleats on the skirt. I just wore this skirt on my blog, I love it and can't wait to remix it. I'm totally in love with the skirt in combination with the two flowers! Lovely blog! You offer so many different style options! I am in the Bay Area too! This skirt is FAAAAAAAAAANTASTIC! Love the color on you! So striking and bold! You are too too cute. I'm so happy to have discovered your blog by way of the Fossil site. I'm adding you to my blog rotation! Thanks for the inspiration!! Wow I love this whole look, what a pop of colour - those flowers are gorgeous, and I looovve the skirt!! You look beautiful! Hope you're having a great week! My Favourite Piece is the skirt!